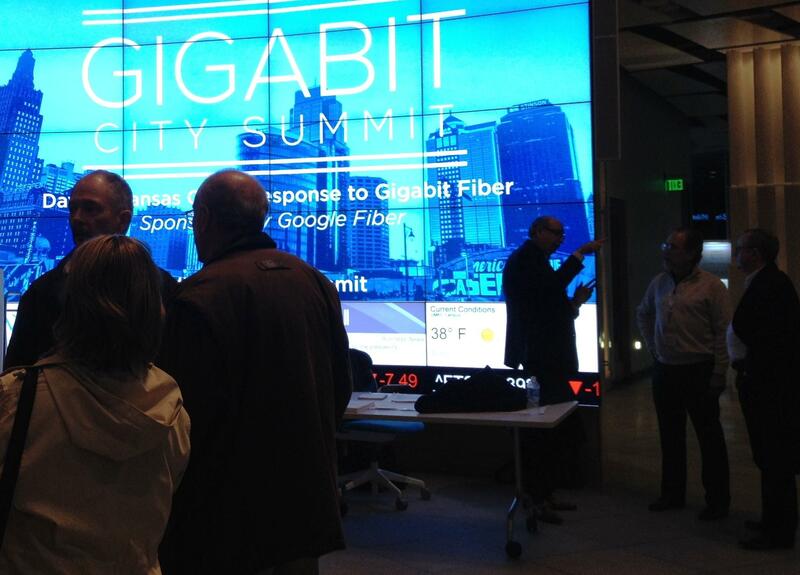 The Gigabit City Summit in Kansas City brought municipal broadband activists together, just as President Obama weighed in on their side. Increasingly Americans see fast internet as being more like a functioning sewer line, than a luxury. And to that end, a number of cities are trying to get into the internet provider business. But laws in 19 states hamper those efforts. President Obama wants to lift those restrictions. Supporters of what’s known as municipal broadband can’t wait. While President Obama talked in Iowa about municipal broadband, a couple hundred people attending something called the Gigabit City Summit, in Kansas City, cheered him on, especially when Obama made a shout out to a coalition promoting high-speed internet called Next Century Cities. The group's executive director, Deb Socia, says dependable high-speed broadband has become a social justice issue. Anyone who’s ever died a little waiting for a page to load or a stalled movie to resume wants faster internet, but the major internet service providers don’t face much competition in some places, so they’re not all that motivated to upgrade. Faced with that, some towns have gotten into the internet business themselves. Mikel Kline works for one of them, Chanute, Kansas. The broadband network in Chanute runs about 100 times faster than typical American internet. Kline says it has given his remote Kansas town one of the fastest growing junior colleges in the country, and connected its hospital to distant specialists. Kline, who’s an engineer, says all of this was feasible because Chanute already ran its own electric utility. “The City of Chanute already has bills produce on a monthly basis, they already have line workers, utility poles, the rights of way. The infrastructure is largely in place to make it an easy to construct network,” says Kline. But the cable industry has a warning for towns that don’t have that ready-made infrastructure, says Brian Dietz with the National Cable and Telecommunications Association. “There’s been several examples when government run networks have failed because they weren’t able to compete with private run networks,” Dietz says. Dietz points to Provo, Utah. Provo spent almost $40 million building a fiber network. The system lost money, and the city wound up selling it to Google for $1. Dietz says internet service providers have invested more than $230 billion nation-wide building networks. “Clear evidence shows that cable operators are investing billions of dollars to deliver the best possible internet services that they can to consumers,” says Dietz. Cable companies have been pretty successful at convincing state legislators that taxpayer-funded municipal broadband is a bad idea. Nineteen states now prohibit or at least discourage public involvement in the broadband business. It’s hard to quantify the effect of those laws, but in places, they’ve left some people stuck with slow internet, while their neighbors enjoy world class service. “The situation is awesome in Chattanooga,” says Ken Hays, President of the Enterprise Center in Chattanooga. “We’ve got a great city, got great political leadership, great business leadership, and we’ve also got the largest city-wide, gigabit network in the country,” Hays says. But just outside Chattanooga’s 600 square mile, gigabit network internet speeds plunge. The city wants to expand service to outlying areas, but ran smack into one of those prohibitive state laws. “Our electric utility actually petitioned the FCC, along with Wilson, North Carolina, to ask the FCC to use their authority to override the legislatures,” says Hays. Those petitions are pending, with decisions likely within the next few months. President Obama wants to nullify those state laws as part of a broader push from his administration to encourage municipal broadband. Internet service providers, and some Republican leaders say the FCC has no authority to meddle with the way states regulate the internet. Still, Socia sees a municipal broadband breakthrough on the horizon. “This is a moment in time that feels like we’ve just been waiting for,” says Socia. Kansas City isn’t waiting. Google built its high-speed network here in partnership with local governments. That’s why Kansas City hosted the Gigabit City Summit, which as Jason Harper, with KC Digital Drive says previewed a gathering the Obama administration plans to convene in Washington. The Overland Park City Council will vote Monday night on a pair of plans to bring Google Fiber to the Kansas suburb, months after striking a preliminary deal. 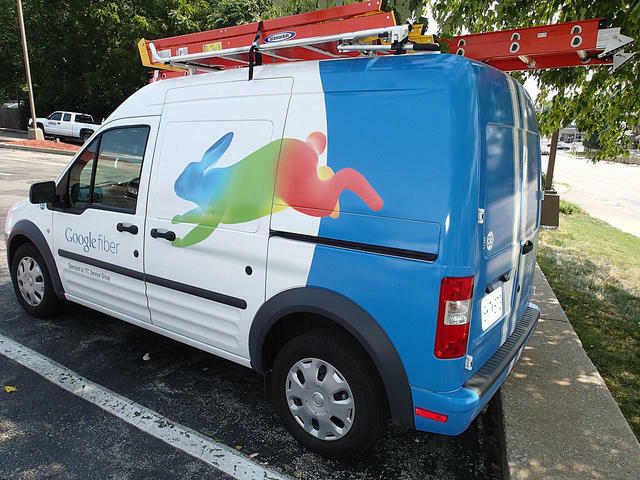 Google Fiber walked away from that discussion after several council members asked about liability for city-owned utilities such as light poles, even though they ultimately wanted to approve the plan. That shouldn't be a problem moving forward, says Councilman Paul Lyons.